In a previous post we mentioned the different types of motorcycle classifications that you will commonly find. One of the several classifications we mentioned was off-road motorcycles. Off-road bikes are also known as dirt bikes. They are popularly used for riding on trails as a hobby and going on outdoor adventures or also for competitions. There are two main types of dirt bikes, two-stroke and four-stroke and today we will discuss the main differences and the lubrication needs of both. Two-stroke engines have a simpler process in which the engine fires, igniting the spark plug for every revolution. What this means is that once every revolution of the crankshaft the engine produces power. This causes it to have a stronger power and reach higher speeds. Two-stroke engines are also much more lightweight the fact that they don´t have valves contributes to their lighter weight. Their light weight, along with the faster more intense motor kick makes them better for tricks and easier to throw around. Although the parts for a two-stroke dirt bike tend to be cheaper this type of dirt bikes do require more constant maintenance. 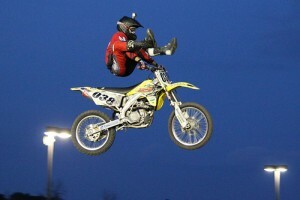 Also, they may be more lightweight than four-stroke dirt bikes but they are also more unstable and harder to control. They may also be a little more difficult to ride because they need more frequent shifting but this does make the reach better speeds if the rider knows how to correctly manipulate it. Another downside of two-stroke dirt bikes is their lack of a separate lubrication system. You see the motor oil is mixed with the fuel and that is how it gets to lubricate the parts. As the fuel travels and burns off so does the motor oil. However, that usually leads to a nasty motor oil burn off that not only creates an untasteful smell but can also be harmful to the environment. Nevertheless, newer two-stroke dirt bikes are being created with better clean burning engines and fuel injection that is safer for the environment. Two-stroke motor oil can come in either pre-mix or injector safe presentation. Premix is more common and it is necessary that you verify with your owner´s manual what type of oil it requires and what oil to fuel ratio you need to mix in. Premix oil requires that you mix in a certain proportion of oil to fuel and add this solution. Injector safe oil can be added directly. For more information on two-stroke motor oil rations and additional information, be sure to check the following advice at the Dirt Bike Tips and Pics website. The most important thing is that you use quality oil that can truly keep your engine protected. Whether you have a two-stroke or four-stroke engine you need to ensure that the products you use are of great value. Synthetic oil is ideal for all kinds of dirt bikes because it provides the best corrosion protection and full lubrication available in today´s market. AMSOIL provides the best grade of products and quality synthetic oil for all your engine needs. Contact Power Sports Oil today. Four-stroke dirt bikes also have their pros and cons. For starters, their more complex system and more prolonged process cause the engine to only fire every two revolutions of a crankshaft. This gives it less kick but provides a better stability and more foreseeable power delivery. Four-stroke dirt bikes also have a more smooth powerband that makes them easier to ride. Many new riders prefer four-stroke dirt bikes because they can easily be controlled and are more predictable. They are also easier to maintain, although the parts and pieces tend to be more pricey than those of two-stroke engines. The lubrication system of a four-stroke dirt bike is somewhat like that of a car. It has a separate lubrication process and different dirt bikes have a different motor oil grade requirement. Check the owner´s manual for details on what oil grade your dirt bike requires. Some manufacturers provide a range of oil grades that your dirt bike can use depending on the climate and riding conditions. For all your dirt bike´s lubrication needs and every maintenance requirement use AMSOIL. Their quality products will help your dirt bike last a long time and will enhance your experience in every ride. Call Power Sports Oil now at (510) 351-8500 and ask about the different products and lubricants available for your dirt bike.